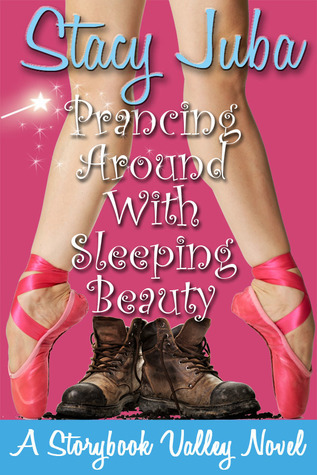 Prancing Around with Sleeping Beauty is a fun, light romance novel. Stacy Juba has created another great story in her Storybook Valley series. After reading a few deep literary mysteries, I was ready for a light-hearted read. I loved Stacy Juba's first installment of the Storybook Valley series - Fooling Around with Cinderella (read my review) - and Prancing Around with Sleeping Beauty didn't disappoint. This is not a fairytale re-telling. Instead, it features a quirky family you own a storybook theme park. In this installment, we meet daughter Aurora Rose - she goes by Rory. She's trying to figure out life. She's dating a surgical resident and works as an instructor at an elite dance school. Life is comfortable. But is she happy? There are some predictable 'chick lit' moments, like Rory falling for the grandson of her grandfather's archrival, but they didn't hinder my enjoyment. The familiarity actually made it a comforting read. If you haven't read the first book, that's okay. We do see Dylan and Jaine but they are just peripheral characters. I really liked the character of Rory (all the characters are great and I look forward to getting to know them more in their own books). While I call this chick lit, there are things that women of all ages can relate to going on in Rory's life. It's not in an over-the-top, all this can't be happening to one person, way. The life events she's facing is very realistic. She's in a relationship with an "ideal catch", but is he really ideal for her? How many of us have stayed in an overly stressing job because we are afraid of taking a chance on the unknown? Who has settled for comfortable instead of risking rocking the boat? Do you have spring break coming up? Prancing Around with Sleeping Beauty would be an excellent choice for your reading entertainment. It's a pretty quick read, so if you haven't already read Fooling Around with Cinderella you should pick up both. Thanks so much for taking the time to read and review Sleeping Beauty. I'm so glad you enjoyed it! So happy you could relate to Rory. She was fun to write.